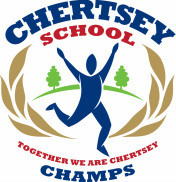 All the CHAMPs at Chertsey School send you a huge welcome! 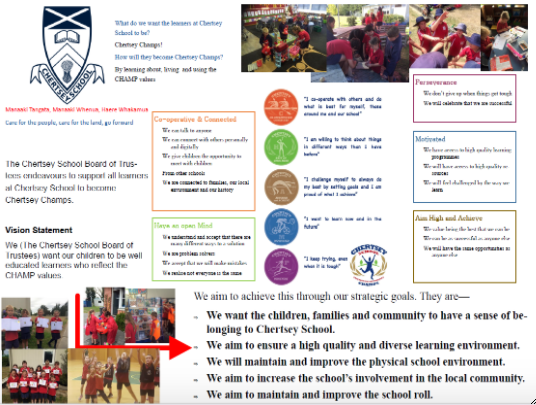 Chertsey School is located in the small rural township of Chertsey, approximately 20km north of the Mid Canterbury town of Ashburton. Chertsey School draws it’s children from the township and surrounding local area, which means the majority of our children come from a rural background and travel to school on bus routes servicing both sides of the State Highway. Chertsey School is a Year 0-6 school and our children are schooled in two classrooms; the Junior Room houses the Year 0-3 students. The Senior Room houses the Year 4-6 students. Upon reaching the end of Year 6 the majority of our students travel to Ashburton Intermediate School by bus for their Year 7/8 schooling. Due to the location and size of our school we have an active and involved parent community who are often seen about the school visiting or helping in classrooms or assisting with working bees and fundraisers. The Chertsey School Board of Trustees has a mixture of skills and experience. The Chertsey School Home and School group is also very active and dedicated and holds a major fundraiser, Cocktails on the Rails, every two years. Staff at Chertsey School do their utmost to ensure that our children are exposed to as many opportunties as possible and we encourage whole school involvement in events such as Triathlon, Cross Country, Ashburton Music Festival, Athletics, Swimming Sports as well as specialised activities such as Miniball. To compliment our fibre optic access, Chertsey School uses a multifunction printer, copier and scanner from Heartland Ricoh. 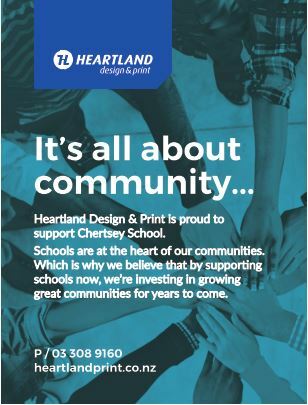 Heartland Ricoh proudly supports education in Mid Canterbury and are proud to be the local supplier of choice for Chertsey School. Daryl and his team always ensure our work looks just as good on paper as it does on screen and the Heartland Ricoh service team are always just a phone call away when we need a helping hand. We have a number of sponsors who help to promote our school through our newsletter. We appreciate their support and ask that you support those businesses that support us. 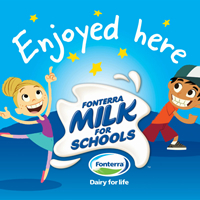 Chertsey School has been part of the Fonterra Milk for Schools programme since June 2013. Each day children are given the option of a carton of Anchor milk to drink as part of a balanced diet. Thanks Fonterra and Anchor for helping our children make good food choices and be happy and healthy. To keep up to date with the latest news 'as it happens', sign up to our Facebook page and Twitter feed. You can select to have alerts sent to your email or mobile phone at no cost. To find out how follow these instructions. Events will be updated on Chertsey School's Google Calendar below. Parents and whanau can also download the Parent and Teacher Calendar app onto their smartphone which will sync our Google Calendar to your smartphone and will update as we add more dates. See below for more information on how to download the app. If you have ever travelled south from Christchurch to Ashburton then you will have passed through Chertsey. Our township is halfway between Rakaia (with the big bridge and the big salmon!) and Ashburton. Check out the Google Map below (if you search for Chertsey School in your GPS please type in our physical address, High Street, Chertsey). We are over the railway line and the second street after the former Chertsey Tavern.